Think of any tourist destination near your home and the likelihood of you not having visited it or did rarely visit the place is high. I would bet for this claim. It's surprising but it's true, sometimes we tend to miss an opportunity for too much familiarity. This holds true to my not having visited Villa Escudero despite being a native of San Pablo City, Laguna. My parent's home is roughly 15 minutes away from the place but I didn't have a single chance of visiting it while I'm still living there. To add more irony to it, my high school classmate belongs to the prominent family who owns the Hacienda. Many times I was invited by her for a day tour to which I will usually respond a procrastinating next time. Gladly, we finally found the luck to pop in. Yesterday was National FaMEALy Day. 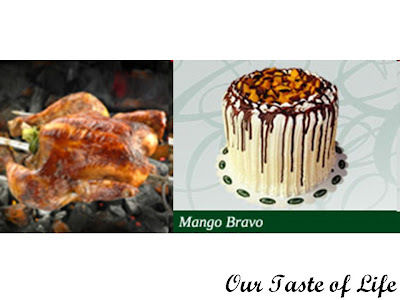 My husband and I celebrated dinner with the kids with their ever favorite "Lechon Manok and Mango Bravo dessert". As we were partaking in God's bounty, I can't help but stop eating once in a while and feel some guilt within. Here we are in our dining table blissfully sharing a wonderful meal, while a big part of the country is trapped in a catastrophe. Silently resting inside my head were questions on families in the midst of flash flood and who have not eaten yet, parents and children who were separated from one another by the terrifying flash flood and those people who have lost their homes and loved ones. These were certainly not good thoughts to be entertained while at the dining table. But the aftermath of typhoon ONDOY was really too much to bear. I can't even withstand the photos and videos of the news. They were more than heartbreaking and tragic. If you've been a regular here, you probably have noticed that much of my food posts and recipes talked about the world of Culinary and Savory. Blame it to a decade of work in this field, my taste buds were oriented in the meaty- savory notes to a great deal. Now that I'm beginning to explore the other half of the sensory pie which is Sweet, I'm missing the customary taste of salt and umami. Hence, I found myself one morning stirring a bowl of noodles for a comforting treat. Much to my (and the kids) delight, we even consumed it with the exciting flavour notes of baked goods (shown above). I can only care less whether the dining table carried a perfect breakfast match or not. Ultimately, it's my (and the kids') liking that's chief. Last year, together with millions of Filipinos across the globe, we joined in the celebration of Lucky Me! 's advocacy on FaMEALy occasion at home. It was that time of the year where all members of the family were encouraged to go home early to sit at the dining table. The TV campaign shows us clearly how valuable family meal occasions are. In fact, the recent ad is another eye opener - a "cut through" information specially for parents. Like how I mentioned in my previous post, I believe in the value of families eating together. The studies are quite alarming. Suffice it to say, conclusive enough that we must all live this advocacy. Read my previous post here. Hence, this coming September 28, 2009 (monday), let's all join once again to celebrate FaMEALy Day at home! Mama & Papa, Mom & Dad, Nanay & Tatay, Itay & Inay, don't forget to dine with the kids on monday night! Because the family that eats together, stays happy forever! One of the many things that put a certain trademark in a place or a country is food. When we seek for descriptors of a place we've been to, normally we associate it with the foods it is known for. And when we talk about the country - Singapore, what else will top the list of the most popular dish here other than CHILI CRAB?! When this scrumptious dish landed unto my palate the first time I visited Singapore, I am more than convinced that it is one kind of dish to crave for! So back at home, I exerted all efforts finding the right recipe of Chili Crab that would suit my sensorial tastants. After much trial and error from one pot to another, I've finally stirred one that's just right for my taste buds. As every liking and palate are unique in everyone, I would recommend to those who would try the recipe to modify it in any which way you might like. Just go ahead and experiment! I just got back from a week long visit to Guangzhou, China, my first international travel for the year. Likewise, it was my first time in the southern part. Amazed, intrigued and surprised, that's probably how I will describe my experience exploring what's believed to be the southern economic hub. I was surprised that Guangzhou is fast becoming another of China's cosmopolitan area. From what I heard, it's considered the 3rd largest city next to Beijing and Shanghai. Building constructions are everywhere and style and architecture wise, it doesn't pale in comparison with those in the nearby Asian countries like Singapore. However, the outskirts of the city still has that remnants of conservative Chinese civilization. In Panyu District where I stayed most of the time, it has that particular ambiance. But more and more China is really well set to make its significant presence in the world.